We are going to Walt Disney World. Yay! There has been a lot of behind the scenes planning going on around here. As you can probably imagine we are extremely excited! We love everything Disney. One look at our social media feed and the secret is out! We have been pretty loyal to Disney Cruise Line for the last few years, so we thought it was time to take another trip to the Most Magical Place on Earth. 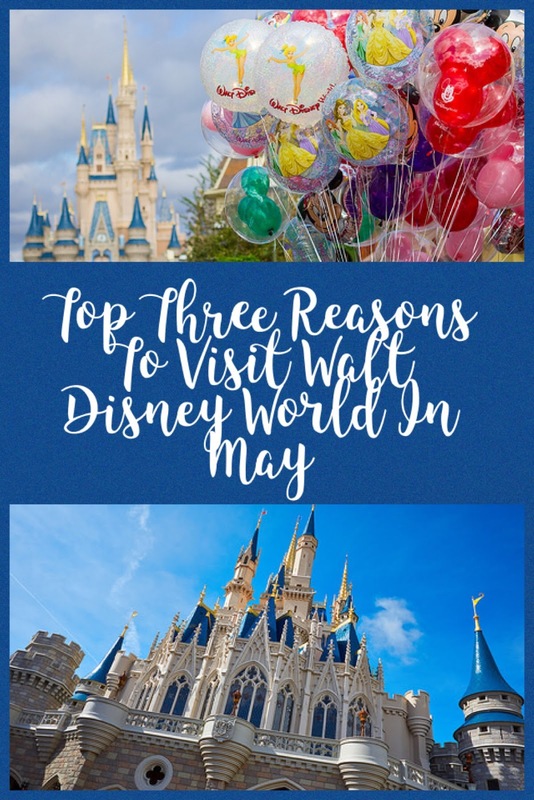 And since we love to share, we thought we would give you our top three reasons we are choosing to travel to Walt Disney World in May (other than my birthday and Mother's Day). The Epcot International Flower and Garden Festival is the main reason we are traveling to Walt Disney World in May this time. We have looked on enviously over the past few years as our social media feed fills with glorious garden filled photos from Epcot every Spring. We have never been, but this year will change that! Epcot’s Flower and Garden Festival runs from February 28 - May 28, 2018 this year. As part of the Festival, there are Outdoor Kitchens offering amazing food and drink options; Disney-themed topiaries; garden spaces and wildlife habitats; and even an outdoor concert series called Garden Rocks. We are foodies, so I think we are most excited to try all the delectable treats the Festival has to offer. The Outdoor Kitchens are set up in World Showcase and are open daily from 11:00 AM to 9:00 PM. CLICK HERE for a list of all the amazing offering this year. We will be sure to post plenty of pics of all the yummy creations we try throughout the trip! May in the Orlando area is usually warm, but most of the time not unbearably hot. Just the way we like it! We can freely swim in the pools without shivering but not bake in the heat all day long. Temps are generally in the mid 80’s. That doesn’t mean that it can’t get hotter. This is just general temperatures. The later in the month you go, the hotter it gets. Mid May does start rainy season so you need to be prepared to get a little wet, but showers usually move through at a decent pace and unlikely to rain out your entire day. For the most part, after doing a lot of research, I think the beginning of May is one of the best times of the year to visit Walt Disney World. Kids are still in school, so the summer rush has not started yet. But it is after Spring Break so you don’t have to deal with those crazy crowds. If you check the crowd calendars, they are lower in May than during the peak summer months. There are many great crowd calendars out there. Two of my favorites and I think some of the most accurate are Kenny the Pirate and Dad’s Guide to WDW. Now it appears that crowd calendars are not as accurate a predictor of actual crowds as they have historically been in the past. Let’s face it, Walt Disney World just keeps getting busier and busier as years go on. But these calendars do help. Is There Really A Bad Time to Go To Walt Disney World? I can hardly wait to share our trip with everyone. Stay tuned as our trip gets closer for some fun posts including tips and tricks about what to bring and wear. We are excited to be going to Walt Disney World in May. We scheduled the trip for my birthday which is coincidentally on Mother’s Day this year. I can’t think of a better way to spend the day than at the Most Magical Place on Earth with my most precious things on the planet! Would you like more family fun activities, travel ideas, projects, recipes and more? Check out and follow Midwest Family Food and Fun on Facebook, Twitter, Instagram, Pinterest, Google+ and Bloglovin'! I want to visit!! I love Disney, but it's always tough to figure out timing. Have fun on your trip! Thanks for the resource! Thanks! Planning the perfect time to fit into life seems to be one of the hardest things! We have been trying to plan this trip for a couple of years and it has finally all come together! Ahh, the only reason I want to go to Disney is to visit Epcot! I love Epcot! My favorite or World Showcase!! May is the perfect time to go to Disney! We live in Orlando and May is not too hot and not too crowded yet! I know! I have been trying to get a trip in May to work into our schedule for a few years. So excited to finally make it happen! I love Disney - we have annual passes! I absolutely love the flower and garden festival. Food and wine fest used to be my favorite but flower and garden is easily a close second if not number one. It’s always so beautiful! The only reason I prefer food and wine is the weather has a chance of being a bit cooler. My dream would to some day be annual pass holders and to join DVC! Great tips! I haven’t been since I was 11 but we definitely want to take our som someday! I loved WDW as a kid. It has become even more special to share it with my kids! I would love to go in early May, but as a teacher my vacation time is unfortunately limited to when everybody else is on vacation. The flower and garden festival sounds wonderful though! I know May can be tough to plan into everyone’s schedules. We are so lucky that we homeschool with an online charter so we are able to be flexible with our schedule.